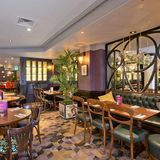 "Henry’s Piccadilly is rich in character and has a warm and inviting atmosphere which makes it a perfect venue for all events ranging from client hospitality to birthdays to leaving parties and Christmas 2016. We are situated in the heart of Mayfair, overlooking Green Park, an ideal location to host any special occasion. Our grand interior boasts high ceilings, stained glass skylights and parquet floors. All of our furniture is moveable, creating a blank canvas for you to theme out in any way you wish. 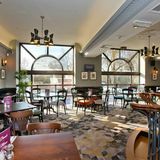 We offer a wide range of dining options including formal dinners, buffets and mouth-watering canapés, and our drinks menu features a great selection of cocktails and wines. Our dedicated events team will plan your event from start to finish ensuring your event is a truly bespoke and memorable experience." By sending this booking your details will only be sent to Henry's Cafe Bar and will never be shared with other third parties. By clicking this box you agree to the Terms and Conditions set out above. You can book to reserve an area of Henry's Cafe Bar for you and your friends. Just enter your requirements below to see what they have to offer. What did you think of Henry's Cafe Bar? I love this bar, it is always full of very attractive people and, if you take a very beautiful Russian lady wearing a little skirt and long boots with you, as I did last time, service is superb, people let you get to the bar easily. I love the atmosphere and the location. When I go there next time I will take the same lady and expect the same level of courtesy and service :0. I have always thought that the prices are actually quite reasonable, bearing in mind the location. I often meet bueisness contacts here after work when I am in London, as it is easy to find from the tube and I know that we will have a great time. As a venue it is pretty good - nicely decorated and a great location and the drinks are of a good quality But the service is abysmal I went for a colleagues leaving do on a Thursday night where it was reasonably busy but not packed - there were tables available to sit and the bar was only one deep - although most of the people there weren't ordering drinks but mostly just standing having a chat.....It was somewhat ridiculous that it then took 35 minutes to be served a drink! If you go there - you have to 100% stand smack bang in the middle of the bar, don't go to the edges of the bar as it seems the bar-tenders (of whom only 2-3 can serve drinks, the others just clean and collect glasses) literally will only serve who is right in front of the till - a couple of steps left or right and you'll be ignored for a long time! The bar staff generally work at a mind numbingly slow pace - I accept cocktails take a while to make but each customer order seemed to take one fella honestly about 10 minutes to make. As said before, it wasn't even that busy and we were at the bar (i.e 3 of us leaning against it trying to get the servers attention) for over half an hour and finally we just had to forceably wave down a barmaid and ask to be served either next or after another gentleman stood next to us who also had been waiting over half an hour. When finally we did order our drinks, it was like we should have been thankful the bar were taking our money - and as a previous barman myself in my student days I hate having to complain and say "Can we get some service please?" as I feel like I'm the sort of customer I used to hate when I did it. But after putting a sizeable tab behind the bar, waiting for over half an hour as barstaff brazenly ignore you is not what you would expect from a pretty expensive place near Mayfair So in essence it is a bar which would be very good if they sorted the service out or hired a decent amount of staff for the venue size. Henry's treated us appallingly. I phoned to book once the day before, and again the day of our visit to confirm my booking using taste card - I was told both times that my booking was confirmed and that it was fine to use my taste card on that day. When we actually got to the restaurant however, I was told my booking hadn't even been written down, and that they didn't allow taste card to be used in December at all. They said that this was stated on the website, but having checked it again since, it clearly is not stated. The staff spoke to me very rudely, making out this was my fault and not theirs. My friends asked to see the manager and spoke to him, but we were offered nothing in compensation - so we went somewhere else instead. The place in itself is quite cosy, but tourists beware: the bill states 'service not included', but the lovely waitresses try to outsmart tourists with their pitiable IQ's by deducting the service themselves from the amount of change due. I continuously keep going back for more at Henry's, and on some occasion have had to go elsewhere due it being so packed. I have always seen the food as value for money and enjoy it every time, although the only downside is the drinks can be a bit pricey, but that's what you get for being in London. Absolutely adore this place, and my partner and i always feel at home here and can relax in the knowledge we will like what we order. Love it! Went to Henry's for the second time last Saturday and had a great time. Drank lots of cocktails and although I only tasted the desserts I went on to a nightclub nearby with a full stomach and a good mood. Henry's is a very relaxed and cool place so def going back again. From Henry's side we sincerely apologise for the way your reservation was dealt with. We have an Events Coordinator now working with us who deals with all the reservations and we can only apologise again and promise that in the future all our customers will recieve suitable information. Our reservation system has in the past unfortunately not been as consistent as we could have wished, but we now do take all information necessary to be able to contact our customers both before and after their reservation, to ensure that we do not miss any important requests and feedback. We hope that you will be satisfyed with our services in the future and that we will have the opportunity to show the improvements we have made in the past six months. Kindest Regards, The Henrys Team. I made a reservation for 8 people at Henrys on New Year´s Eve, for dinner at 7pm. I called earlier in the day and spoke to a gentleman who took my reservation but said, in his exact words, that "the building will close at 9pm", indicating that we should finish before then. I said it would be fine, as at 9pm I had a table booked in a pub nearby to continue celebrating. As I arrived with one friend, and the other 6 were on their way, we were told that the kitchen was closing at 7pm!!!! I made the point that I had made this reservation, but this very important detail was not mentioned at the time of booking. The staff were apologetic, telling me that it was their manager who I had spoken to during the day - who came across as the most incompetent manager I have ever seen!! The manager had taken my reservation but not my contact number. And the staff member I spoke to said that he would speak to his manager about this and he would get back to me - but he didn´t even bother asking for my details! I then had to give him my business card as I wanted an explanation and an apology - and I had to apologise to my friends for this pathetic event and take them somewhere else, which, in New Year´s eve is rather difficult, especially when you are looking for a restaurant that would take a party of 8 people, on a vey busy night. One week has gone by and I haven´t heard anything from them. It just proves, beyond doubt, that the management of this restaurant is inefficient and incompetent, and they don´t care about their customers. I do not recommend this restaurant, especially when there are so many other choices nearby! I only chose 1 star because there is no "zero-stars" choice. Gone are the days when you could only eat and drink at prescribed times. Since the relaxing of the licensing laws, premises are open all and every day. Henry’s café and bar offers food or drink whenever the customer wants it, which is all to the good. The Piccadilly branch (there are two more in London at Liverpool Street and Covent Garden as well as others around the UK) is right on the edge of Mayfair. Opposite Green Park and Buckingham Palace and close to The Ritz, it couldn’t be handier for a stop-off after a hard morning’s shopping in Piccadilly or Bond Street or whizzing round the latest exhibition at the Royal Academy. It’s a big room on two levels, with a long bar. The decor is comforting and gentlemen’s club-like, nothing too modern, nothing flashy, just a smart and welcoming environment for a drink and a meal. During the week Henry’s opens at 8am (Saturday and Sunday from 10am) so you could start with a good breakfast and then do your shopping or sightseeing. As well as the main menu there’s also a brunch menu, a sharers menu and a comprehensive cocktail and wine list. And between courses or drinks you can have access to free Wi-fi. 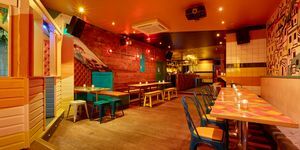 Lunchtimes show that Henry’s is a good place to rendezvous with friends or family. It is congenial for just a drink while you are awaiting your guest(s) and central enough to make it convenient either to have a drink and a snack or just move on to somewhere else. It’s like your favourite local but without the drawbacks that pubs can have. 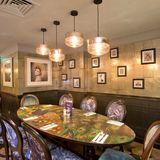 Henry’s is eminently more civilised, the sort of place where you can take the whole family and big enough to accommodate party bookings large or small. No doubt earnest breakfast meetings, power lunches and serious dinners are the main part of Henry’s business, but tempered with visitors and tourists seeking inner refreshment. Starting with breakfast there’s a full monty in the all-day breakfast or the traditional English brunch (bacon, sausages, eggs, tomato, mushrooms, hash browns and toast) or a vegetarian brunch with vegetarian sausages, plus eggs several ways, pastries, muffins and tea cakes. For lunch there’s a classic Ploughmans of ham, pork pie, vintage Cheddar and creamy Stilton with pickles and chutney and ciabatta bread, or classic and deli sandwiches and wraps, burgers, pasta dishes and salads. If you’re not too hungry, there are sharing plates (with potato wedges, nachos, antipasti, fish and chips and Greek mezze options) or a Classic platter of assorted bites and dips. From the starters menu the chilli sauteed scallops (£6.45) make a good choice with succulent king scallops seared with crushed chilli and served on a bed of mixed leaves with a sweet chilli dipping sauce: truly scrumptious. The peppered mushroom and Stilton brioche is almost a meal in itself. Pan-fried mushrooms in a pepper sauce are strewn over the toasted brioche and then topped with melted Stilton which is so delicious it’s impossible not to finish it, cholesterol or no cholesterol. Main courses include steak and fries, sausages and mash, chicken with mustard and tarragon, shoulder of lamb, chicken or beef curry and Scottish salmon. Henry’s Fish Pie (£10.75) is one of the best, packed with prawns and hearty pieces of cod and smoked haddock cooked in a creamy white sauce with mashed potato piped on top. It comes with a separate dish of fresh seasonal vegetables. Beef and mushroom baked suet pudding (£10.45) may not be to everybody’s taste, but then it’s not every day you find suet pudding on a menu. Not for the faint-hearted, this has chunks of juicy beef with mushrooms cooked in a rich gravy, all packed into in a light suet pudding. Comfort food par excellence served with either mash or fries and an assortment of fresh vegetables, it’s unbeatable as filling top nosh. For dessert, the Chocolate Puddle Pudding is a chocolate sponge with a rich chocolate sauce and whipped cream, a luscious pudding if ever there was one - unless of course you’re having the chocolate fondue with a warm chocolate fudge sauce into which you dip pieces of strawberry and banana, slices of fudge brownie and sweet waffles. It’s like dying and going to chocolate heaven! Name your poison at Henry’s from their list of cocktails (£6.45) including long drinks such as Mai Tai, Raspberry Fizz, a Key West Cooler, Long Island Iced Tea, or mojitos, Martinis, short cocktails such as a White Russian, Bellinis, Kir Royale or the classic Champagne cocktail (£8.45). The wine list has glasses from under £4 and bottles from just over £14 to around £23, sparklers from £22 and champagne from £35.95 to £75.95. The Spanish Chardonnay, Ash Tree Estate from Castilla y Leon at £15.45 has a nice, fresh citrus and melon flavours, pale lemon in colour but with a fairly rich finish. To end the meal an Earl Grey tea makes a pleasant change from the usual range of coffees. 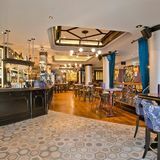 The all-day brasserie has become a boon to everybody and Henry’s seems to be high up on the list of recommendable places to go at any time of the day or night for a satisfying meal or just a drink.